In this video we cover the basics of the video marketing funnel and how to use video content at each stage to fire up your sales and marketing. I'm sure you're familiar with the marketing funnel, sometimes known as the buyer’s journey or sales funnel. In a nutshell, it’s the steps your audience take from first recognising they have a problem to choosing your product or service to solve it. Your audience need to hear the right things at the right stages of the funnel to move them towards sale. You can use content to deliver those messages — it’s a basic principle of content marketing. We’ve found video is such a flexible medium that different types of video content are effective at each and every stage. Essentially, you can use video to take leads through their entire buyer’s journey. We call this strategic, joined-up way of thinking about video — video content marketing. I’m going to show you how to create an entire video content marketing funnel in 4 easy steps, that will guide your leads from first touch to closed sale. 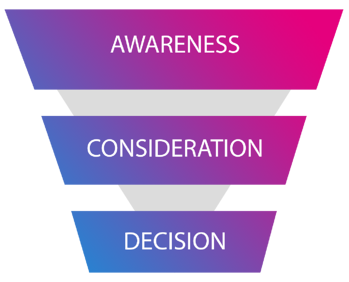 The simplest funnel, and the one we use ourselves, has 3 stages: awareness, consideration, and decision. However, there are many ways to split the funnel. Yours might be longer and more complicated, but however you define your funnel, make sure it represents how your leads discover you, compare their options, and ultimately buy from you. Next you need to work out what state of mind your leads are in at each stage of their journey. What are they thinking about you and your offering? What information do they need to move onto the next stage? What’s stopping them from buying from you, and how can you get them past it? This step relies on a solid understanding of your audience and their values. You should have already done research into your target audience and gained insights into what they care about most on their journey to sale. If you haven’t done that yet, don’t worry — you can click here to watch our video on how to get to know your target audience. At this stage you should be backing up your audience research with data about key conversions along the funnel. Speak to your audience about what makes them want to subscribe to your blog, get in touch with sales, or buy from you. You can ask sales to put these questions to leads, or you can use pop-up surveys on your site. First-hand data is invaluable. If you’re struggling, a good alternative is to speak to your sales team about the most common questions leads ask before buying. Step 3: How Do Your Leads Find You? For each stage of your funnel, think about how to distribute your video content to reach the greatest number of your target audience. At the top of the funnel you’ll mostly reach leads through organic search, paid ads or social media. In the middle of the funnel you’ll probably have captured leads’ contact information, so you can share video content with them through email and your website. At the bottom of the funnel your leads are likely speaking directly to sales — so your videos can be used in 1-2-1 sales communication. However your audience want to be reached, make sure you’re using the right channels for the right stage of the funnel. Again, this is an area that should be revealed through your audience research. Now you know what your leads are asking throughout the funnel, and how to reach them, it’s time to plan what kinds of video you’ll use at every stage to keep those leads moving forward. Here are the videos we’ve identified as working best. At the top of the funnel, in the awareness stage, we split video content into 3 categories: amaze, appeal, and answer. The point of these videos is to make your audience aware of your brand and how you can help them. Amaze content aims to catch your audience’s attention, drawing them in with spectacle and flair. The focus isn’t really on you, but on values you share with your target audience. Big, bold brand films work well here, or video documentaries on topics your audience care about. Appeal content is about consistently reaching out to your audience with shorter, simpler videos that show you understand them. These are often entertaining or inspirational videos seen on social media. Our friends at Blendtec became a marketing phenomenon for this kind of video when they came up with the famous ‘Will it Blend?’ series. Answer content does what it says on the tin — it answers your audience’s questions. These are generally educational videos that give advice on a certain topic, like Moz’s Whiteboard Friday videos. We also include explainer videos in this category, because they explain to leads how your product or service works. Onto the middle of the funnel, the consideration stage. Here your leads are more actively considering solutions to their problem. You should use video to build trust and establish a relationship with them, by educating them about your benefits and what stands you out from the competition. Product or service videos work well at this stage of the funnel. So do case study videos to create social proof and ‘about us’ or culture videos to communicate the values of your team. At the bottom of the funnel, in the decision stage, leads are ready to make their choice about potential solutions. It’s between you and the competition, so you should make it easy for leads to pick you by answering any final concerns they may have. We suggest instructional videos that show how to use your product or service, or shorter, more digestible FAQ videos. 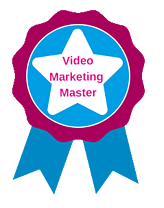 You can even wow your leads with highly personalised videos about their individual needs — to give them that final push towards sale. Follow these 4 simple steps and you’ll have a comprehensive video content marketing funnel planned out, including the types of video you’ll use at every stage, the key messages they need to cover, and how they’ll reach your audience. So you can take that audience from first hearing about your brand all the way to buying from you.